Topography of GAMIGAYA drawings and a legend of NUH. Gamigaya traceries are situated in southwest hills of Camisholan, Garangush flats in Gapijig peak, 3907 meter from the sea level (in Nakhchivan AR and in the territory of Ordubad district). The main area where the Gamigaya drawings are located is Garangush flat. The illustrations, which are located on gray and black parts of cliffs, are mainly in pink view. The drawings had been performed by means of carving and stone chipping techniques. But some few drawings are done through scraping techniques. The locations of drawings are topographically very complicated. The on rock illustrations are in-group shape and they are mainly located on the nearby distance of water sources. We can encounter the likely groups in 5-6 places on the northeast part of Dali bulag. But there exist some illustrations, which go beyond the groups. Fathering from these sources, the illustrations become less. Near the on rock drawings we can meet the small and primitively made shelters for the cattle and horned cattle. Some of the cattle station places are in a circle shaped form. Some walls partially reach to 0.7-1 m height. The ethnographic materials prove that the likely stations were designed for horned cattle. The similar constructions preserved in Garangush flat belong to medieval ages. The nearby-located graveyards also prove it. There is no doubt that, in the ancient period there had been the seasonal residential settlements. In order to discover them we need to carry the archeological excavation works. It should also be noted that the location of on rock illustrations has a vegetation deficiency. As we know, there are a lot of lane places in Nakhchivan, which contain rich vegetation. Batabat and Khurs summaries are examples for these. But in these places there are not on rock drawings. Gamigaya drawings are not connected with nomadic and semi nomadic animal breeding. 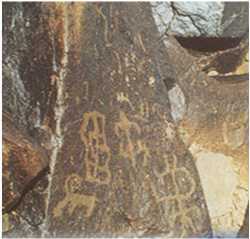 Emergence of on rock illustrations is not connected only with semi nomadic life of the people, but as well with humans’ system of beliefs. A repertoire of Gamigaya illustrations also confirms this idea; because the described wild animals’ fish, snake and insects’ descriptions have not a direct connection with animal breeding. These are connected only with humans’ beliefs. The existence of the legend of Nuh and the fact of Gapijig Mountain’s location on the highest peak of the Small Caucasus, and also the existence of Garangush lane in Bibgatal worship place, which are related to Gamigaya once again, could serve as a testimony to these thoughts. From this viewpoint the existence of on rock illustrations namely at the nearby of worship places - the idea which is put forward by some researchers, is quiet relevant to reality. Geologists up to 1965 have not discovered Gamigaya illustrations. After the illustrations found it began to draw the attentions of different professionals and all of them have put forward a various specific thought. From this viewpoint Vali Aliyev’s investigations, which were launched since 1968, should be distinguished. During the research works a large parts of the illustrations’ photos were taken and later they have been published. In 1993 Vali Aliyev finalized all these researches by publishing his analytical book dedicated to this. In there published articles A. Huseynov, F. Y. Safarli, N. Museyibov also gave information about Gamigaya monuments and its illustrations. All on rock illustrations all over the world are the samples of pictographic signs. A pictographic sign in its real meaning is not writing, but it is a device transmitting content through signage and drawings. That is why there is no doubt, all on rock drawings and illustrations assume a concrete content. It should be noted that some researchers who dealt with Gamigaya investigations some times called these illustrations as hieroglyphs or runic writings. Some tries made by some researchers for the search of alphabetic elements on Gamigaya are also connected with this. That is why from this viewpoint, eventually making some attempts to link these drawings to totems and productivity and naming these drawings as tamga could be regarded as a successful point. While speaking about the rear sample of the world art Gamigaya we cannot pass by a legend of Nuh, which is related to this monument. The historical roots of this legend, which has got a variety of versions among Azerbaijan nation, are closely connected with ancient shumers. Up to archeological investigations carried out in Mesopotamia there was known only the Jewish version of this legend. During the archeological excavations in Mesopotamia and after reading the findings related to the hieroglyphs on the clay boards it became known that there was written a shumer legend of how the World was flooded. A history of the clay boards on which was written a legend should be traced back in the first half of the II era before our century. According to the legend during the world typhoon Ziusudra had taken the entire alive world into its ship and saved it. But according to the legend about Bilgamus Utnapishitm carried out this duty. Having read all these writings on the clay boards the world scientists became aware of that the Nuh typhoon Jewish legend depicted in Bible has taken its topic from shumer legends. As shumers were wiped out from the history the hieroglyphs were for a long time kept in secret and the shumer legends were forgotten; but the world people new only about the legend of Nuh described in Bible. A legend about Nuh, which constitute the basics of the Muslim legends about the world typhoon, had a great influence on the literature of some oriental folks as well as Azeri-turks. And this influence had been so great that a number of medieval age authors started to connect the origin of Turkish people with Nuh. A brief content of this legend related to Gamigaya is as following. - The world surface was covered with flood. After Nuh’s ship rambled on the waters for a long time his ship touched on one mountain. Nuh said that it was a heavy mountain (“heavy” in Azeri means “agir”-Transl.). They started to call this mountain Agri dag. Nuh’s ship touched the second mountain again Nuh said: believe me this is a mountain (“believe” in Azeri means “inan”-Transl.). And they started to call this mountain as Inan dag-Ilanli dag. When Nuh’s ship touched the mountain for the third time he told that this is a Kamchigaya. After kamchi Nuh’s ship approached to Gamigaya according to the legend Nuh’s ship stayed in Gamigaya and turned into stone. And all the people who were on the ship they went out to the beach and continued their lives. Those, who believed that all aspects of this legend were true, tried to look for the wreckages of Nuh’s ship in Gamigaya and Agri dag. Basing on this legend the Medieval age authors put forward the hypothesis that the world and the origin of Turks took its beginning from Nuh. Recently they have been put forward some hypothesis that the Nakhchivan, Nahajir and Nehram toponymy were also connected with Nuh. There also exist some ideas that the Gamigaya illustrations were made by those people who were in Nuh’s ship. By the way, we should note that the researchers rightly connect the Nakhchivan toponymy with Nuh. To our mind those who count that a toponym “Nakhci” calling the name of tribe and ending “van” denoting the notion of space are right. Without doubt, the mythological episodes shown in the legend Nuh assume a great importance in study of our past way of thinking. But this does not give sufficient grounds to connect the Nuh legend with the origin Turkish nation. In his time Mirali Seyidov also note that sometimes we mix the origin of legends and myths related to Islam with the Jewish legends. The world scientists have for a long time been thinking whether the legend about the world typhoon was true. At last the excavations carried out in Mesopotamia gave answer to this question. During excavation it became clear that on the IV era before our age there had really been a big flooding in Mesopotamia. During the flooding the flat lane area of Mesopotamia, starting from Elam up to Syria the flat lane areas had remained under the water, as a consequence of it the residential settlements of Al-Obeyd and Racabiyya have completely been abandoned. Although the flood destroyed Al-Obeyd culture, life still continued there. The analysis had shown that when the majority of settlement remained under water in Mesopotamia the people started to think that all over the world was flooded as it is seen, not all the details related to Nuh’s ship are correct. Since the life originated on the earth they have not been the likely accident when a flood covered all over the world. The incidents depicted in this legend to some extent are exaggerated. Despite of this entire there still exists a legend that Nuh is a historical personality and his grave is in Nakhchivan. K. A. Nikitin’s article “Nakhchivan province and Nakhchivan city” somehow caused the spread out of the likely ideas among the researchers. Later, B. Gangarli’s painting work “Nuh’s grave” had also reinforced these ideas. It should be noted that the historical roots of the universe are not only disconnected from the Nuh legend on the contrary the emergence of human beings and their activity is much older than this legend. The world archeological updates indicate that the human society was originated 2.5 – 3 million years ago. The archeological excavations performed in our country Azerbaijan had proved that the first human settlements had been in Azerbaijan 1.5 million years ago and since that time Azerbaijan had been included into anthropogenic zone. The stoned jaw bones belonging to the primeval humans found in Azikh cave is considered the oldest finding in the world. The archeological investigations had proved that the first residential settlements in Nakhchivan were in the Middle Paleolithic age. It is clear that there is no any necessity to use the legend of Nuh for artificial rising the historical age of Nakhchivan. And also the history of this legend goes to some 7-6 thousand years back. From other side the flooding that happened in Mesopotamia did not cover Azerbaijan and during V-IV eras before our age (B. D.) there was a prospering culture. Basing on the legend of Nuh, and calling Gamigaya drawings be the most ancient drawing works, is not right. As we mentioned above this legend comparing with the origin of the universe is much younger. From other side we should note that the people never created the art works. The archeological excavations proved that the emergence of art was closely connected with appearance of Homo sapiens. We can encounter the drawings belonging to the last period of Paleolithic age in Altamira- Spain, in Lyasko-France, in Lena valley-Siberia and in other places. In Azerbaijan the most ancient drawings belonging to Mesolithic age were discovered in Gobustan. A majority of drawings in Gamigaya belong to the Bronze Age. But their exists a possibility that in future there also can be found much older drawings.